Planning for a successful retirement can be confusing and complicated. Individual investors are faced with difficult choices, sales pressure from brokers, and the easiest thing to do is wait until a better time to plan. Time is money, and waiting to seek help with your retirement savings may limit your financial future. You are not alone, and our wealth advisors like Ryan are experts at getting you started now on a path of financial success. Ryan’s experience includes managing investments for current and future retirees, helping them plan for future income needs, financial planning for widows/widowers, and advising not-for-profit organizations. He also has significant experience coordinating with local tax and legal advisors to make sure your investment plan will be tax friendly and match your estate plan goals. 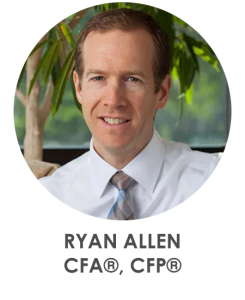 Ryan is a Chartered Financial Analyst (CFA®) and Certified Financial Planner (CFP®) professional with 21 years of experience in the financial industry. Ryan is a Michigan native and proud to call Grand Rapids home for himself, his wife Rebekah, and two children. They enjoy every season, with family ski trips up north and summers at the beach or in Leelanau County. Along with his son, Ryan is a competitive cyclist and regular fixture at many of the mountain biking and cyclocross races held across the state.